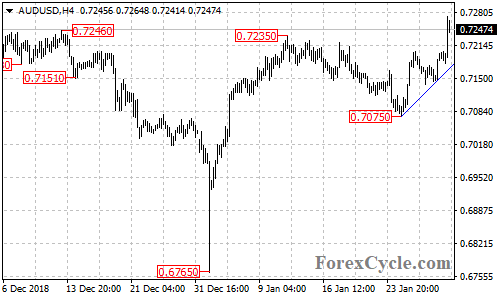 AUD/USD extended its upside movement from 0.7075 to as high as 0.7272, breaking above 0.7235 resistance. Further rise could be expected after a minor consolidation and next target would be at 0.7350 area. Support is located at the bullish trend line on the 4-hour chart, only a breakdown below the trend line support could signal completion of the uptrend.